Overview (no spoilers): Having been born and raised in rural Michigan I have an innate pride in my home state, even down-and out-Detroit. 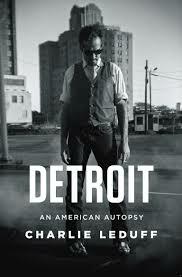 Detroit: An American Autopsy follows Charlie LeDuff’s first hand experiences as a reporter in the Motor City. LeDuff had carved out a successful career as a reporter for the New Times before returning to his troubled hometown. His experiences weaving through the corruption and poverty in Detroit left me in often in disbelief and tears throughout the book LeDuff’s rough and crude attitude delivers stories in the matter-of-fact manner of a reporter with the unique struggle of continually reporting on the misery of his hometown. Overall, a great read, mixing Detroit’s rich history with its tumultuous tribulations involving politics, and the Big Three all coming to a head just under a decade ago. I lived near Detroit for several years and became fascinated by its “rise and fall.” From a history of being one of the most prosperous and innovative cities in the world in the 1950’s, by the turn of the century it had a core city with decimated neighborhoods surrounded by some suburbs that still reflected the extreme wealth of the post-World War II boom. There are a vast array of stories within this greater historic narrative of an overwhelming American success followed by incredible struggles and uneven community health.